As regular readers of this blog would know, Cthulhu Reborn has a long history of providing professional-quality Lovecraftian game stuff either for free or almost for free. It’s the reason the blog was founded after all. Over the years our ambitions have expanded from purely brushing up pre-existing public domain scenarios to creating brand new material and even new settings. That’s been highly successful, and lots of people have picked up our PDFs and printed books. But there has always been a fundamental thing that’s constrained us — namely, the desire to pay writers and artists a fair rate for their original work even when the product we’re creating is free. This is something we’ve tried tackling in different ways over the years. Our latest experiment in funding free content is Dateline: Lovecraft, which we’ve spruiked several times here on the blog already. The “business model” behind this is that of a core product which people need to buy, coupled with an expanding range of free add-ons that enhance the usefulness of the core, all funded by the sales of the core product. The basic idea is that all profits from the original Dateline: Lovecraft sales will go back to commissioning writers and artists for the freebies. As an example, we’ve already released the first of the free add-ons. Now, it may seem to the average gamer that having a paid product for sale on DrivethruRPG and RPGNow is a license to print money, but as anyone who’s tried publishing things for themselves will know the revenue from selling game books isn’t necessarily as huge as you’d think. This is especially true when you consider the cut that retailers take from the cover price, and also the cost of producing the books in the first place. While most people don’t share much information about the financial side of their publication efforts (or Kickstarter fulfillments for that matter), the unique nature of the Dateline: Lovecraft “experiment” makes me think that it’s only fair to disclose some of those details here. The production budget for commissioning work on the core Dateline: Lovecraft product and its first freebie was about US$410 — that’s the cost of paying Jo a fair rate for her excellent writing in the add-on scenario and the cost of a couple of awesome illustrations from Reuben. 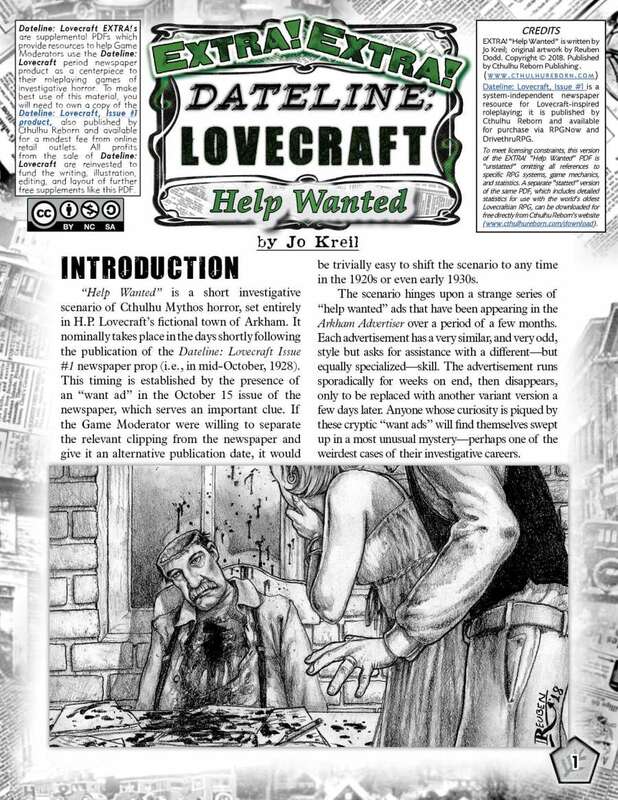 The many, many hours that went into creating the Dateline: Lovecraft newspaper prop itself and also the rest of the writing, illustration, and layout work that went into pulling the PDFs together is somewhat of an internal cost (i.e., Cthulhu Reborn did the work itself rather than paying real money for it). We’re not seeking to pay ourselves for any of that. However, even with that fairly modest external production cost, the core Dateline: Lovecraft product still needs to sell somewhere between 45 and 55 copies to break even. Each freebie add-on will likely cost a similar amount in terms of production cost, so realistically we will be be in a position to release the second freebie once we’ve sold around 100 copies of the core product. Of course, the fact that some people chip in a small contribution in return for the Pay-What-You-Want add-on PDFs certainly helps nudge that along, but realistically most of the revenue will need to come from sales of the core product. In the couple of weeks since Dateline: Lovecraft was released, we’ve earned enough from sales of the core and PWYW contributions to have hit the “break-even” mark. That is, we’ve now earned back what it cost us to make the items we’ve released. So, profits from here on are now going towards funding the second freebie PDF. Overall we’ve been pretty happy with the rate at which our product has been selling … but obviously we’d be even happier if the PDFs were flying off the shelf. Realistically, it is a very competitive market — there are a lot of great new products being released, especially in the Lovecraftian RPG world — so we’re happy to attract whatever discerning buyers we can. Speaking of the second freebie scenario add-on, I can also reveal some details of what this product will look like. The scenario will be called “Smoke Green” and be written by Noah Lloyd (of https://reckoningofthedead.com fame). It’ll be about 8,000 words. The all-new illustration for this scenario is an awesome piece by Reuben Dodd, shown above. And yes that is a beaten-up Mi-go in a cage. What’s it doing there? We will have to wait until the scenario add-on (hopefully) gets funded! The month of October is synonymous with horror, especially in the gaming world (which seems to have taken Halloween and spread its evil taint across an entire 31 days). To celebrate all things horrific, we’ve decided to offer our recently-released Dateline: Lovecraft core product at 20% off for the whole of October. If you’ve been tempted to pitch in to buy our newspaper but aren’t sure, maybe a few [[insert-local-currency-units]] off will make it appealing to you! Of course the awesome free add-on scenario by Jo Kreil is still … free :). 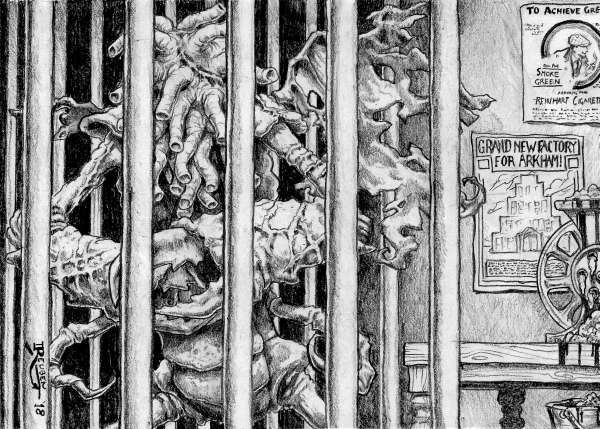 As mentioned previously, we are also putting the finishing touches on our next Convicts & Cthulhu “Ticket of Leave” supplement, featuring new artwork by the ever-horrific Reuben Dodd (see above). This will be our 13th C&C supplement, and we decided it would be neat to theme it to be about superstitions and folk magic in early Australia. Of course, not long after making that decision … mysterious and unexplained things kept happening … which have delayed the release of this supplement, which was originally due in late August! And of course Spooky October is about much more than Cthulhu Reborn. We would strongly urge you to check out what other great gaming publishers are doing to celebrate gaming’s most fake-cobwebbiest of months. Over on the Sentinel Hill Press blog, plucky cemetery-explorer Bret Kramer has kicked off a series of Grave-themed articles called “Grave-tober”. Something else that has excited us is Pelgrane Press’ imminent release of Hideous Creatures, a massive 352-page hardback book which revises and greatly expands Mythos creature writeups by Ken Hite previously only available as part of KWAS subscription bundles. The reason this forthcoming release is especially near and dear to us at Cthulhu Reborn is that the new book adds a treasure-trove of in-world “handout-style” documents relating to each of the nasties described in the book … and Pelgrane asked yours truly to design those pieces. That all adds up to 31 weird handwritten, typewritten, or newspaper-published pieces of 1930s goodness, collectively sprawling across about 50 pages of the book. On top of that I also did layout for this behemoth of a book, and designed the title logo you can see splashed in lurid green across the cover. Pelgrane have just listed Hideous Creatures as available for pre-order on their website. Well … it’s been a big week for us here in the Cthulhu Reborn bunker. Not only have we released Dateline: Lovecraft (a product that we’ve had in the works for ages), but we have been making a lot of progress on the next “Ticket of Leave” supplement for Convicts & Cthulhu. The latter was technically due out in August but needed to be pushed for a bunch of reasons, and will hopefully be out in the next week or so. On the Dateline: Lovecraft front, we couldn’t be happier with how well the (paid) core product has been selling over on RPGNow — not only has it been lurking around the #6 top seller on that site, but it’s also raised more funds for Cthulhu Reborn in few days as we’ve raised for other products this year. Sales of the (pay-what-you-want) scenario add-on have also been exceptionally good. In just days profits from sales of these two has covered almost a quarter of the money we put into bringing Dateline: Lovecraft to market. That’s a great sign for us being able to spin off more free PDFs, once we’ve earned enough to commission new content. A few people have asked for some more previews of what the pieces of the Dateline: Lovecraft newspaper prop look like — I guess so they can make their own judgement about how “authentic” and “game-able” they might be. We put together this montage which shows just a handful of the 200+ items which make up the newspaper: hopefully, though, it gives prospective purchasers a bit of a better guide as to what they’ll be getting. Remember, that while the newspaper is the heart and soul of the product line, the core package also includes a 58-page guidebook with a complete scenario plus a bunch of campaign ideas and material to make it easier to integrate newspaper-related-content into your game. We also had several questions from folks who are curious about exactly how we plan to create free PDF scenario add-ons and how much money we’ll need to raise to be able to do that. Those are excellent questions, but probably worthy of a blog entry of their own (so I’ll defer them til another day). 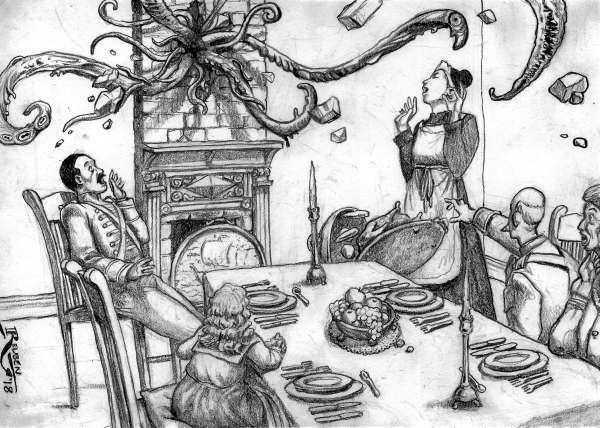 The subject of newspaper-based clues and their role in Lovecraft-inspired investigative roleplaying games is one that has occupied rather a lot of my attention recently. That might seem like a crazily specific topic to fixate upon … and I guess it kind of is. But the process of putting the finishing touches on our forthcoming newspaper-based product Dateline: Lovecraft has given me plenty of reasons to dwell on such matters. For those eagerly awaiting Dateline: Lovecraft, the news is pretty good. The newspaper prop which forms the core of the product was completed a month or so back and given a truckload of digital treatment to make the pages resemble realistic OLD pages of type. More recently we’ve been focusing on content to go into a supplemental PDF that will come bundled with the prop PDF, and provide some helpful advice on using it to enhance your game. Included in that PDF is a wealth of index-type info about the prop, some advice on printing massive pages on not-so-massive home printers, a full system-independent scenario to illustrate how newspaper clippings can fuel an adventure, and some more general advice on different ways newspaper clues can appear in a scenario. The last of these has been my biggest excuse for newspaper-prop fixation. And because the advice that we’ve included really is true for any investigation-based game, and really has nothing specifically to do with Dateline: Lovecraft, I thought it might be a good thing to also share here. You can consider it a special sneak peek at part of our forthcoming product if that kind of elite “backstage pass” thing does it for you :). One traditional (and much-used) way to kick-off an investigative game scenario is the reporting of some weird or horrific local event in the newspaper. This can be a handy way to quickly provide some information about odd goings-on, as well as potentially provide players with a reason to look further into the murky depths surrounding the occurrence. A minimalist approach to getting Player Characters started on an investigation is to simply arrange for them to read some key article while they are perusing the morning’s news (perhaps over breakfast). To make such scenario launches work, it is always best to ensure that the news story has some kind of personal connection to one or more of the Player Characters. Perhaps someone named in the article is someone that has prior history with them … or perhaps someone whose family is significant to the Player Character. Alternatively, there could be mention of an organization or society that a Player Character has ties with, whether good or bad, or whose name has turned up in other investigations. Another option is that specific details of the occurrence reported in the news article have special significance to the Player Character – if there was a crime scene, perhaps there was some unusual object left behind, whose significance is unknown to the police but obvious to them. The key is to find some way of supplying a clear and compelling motive for having (at least some of) the characters want to get involved. 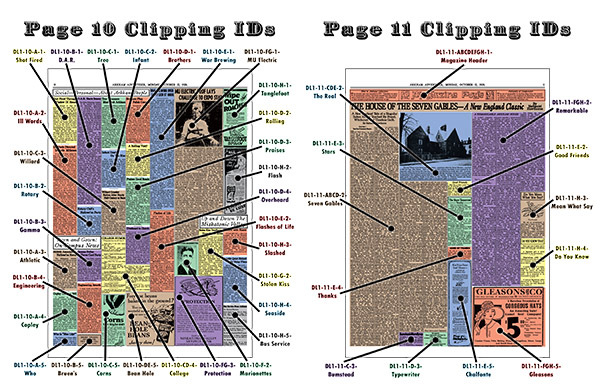 Another way of using a newspaper clipping as a source of background information, is to have the scenario launched by a Non-Player Character coming to a Player Character in search of help – and providing a clipping as background to their request. In this instance, there’s no real need for the newspaper clipping to have any personal connection to the Player Character (although it obviously needs to relate to the specific Non-Player Character). There is also no reason why the clipping needs to be a news story: someone might, for example, point to a cryptic personal announcement from the “Want Ads” and describe how their spouse seemed strangely obsessed with this torn-out scrap in the days leading up to his or her disappearance. Or perhaps an angry “letter to the editor” published in the newspaper was penned by an individual the Non-Player Character wants investigated, in part because of some quirky or unorthodox beliefs that the client can luridly describe. See the box nearby for other ideas about turning different pieces of the newspaper into potential clues. Many investigative scenarios start off with some kind of mysterious event – either someone has gone missing, or some crime has been committed that has no clear suspect, or something odd has happened where many of the key facts remain murky. In such cases, the only clues that any investigator – whether police or the Player Characters – can go on are things left behind by individuals who are somehow involved. Why not make some of those cryptic clues take the form of pieces torn from the newspaper? In this case, the connection between the incident, the individual involved, and the specific newspaper clipping might be something very obvious, or it could be far more indirect and nebulous. An example of the former might be a clipping in which the perpetrator of the current crime is named as the victim’s husband. An example of a more indirect link might be a clipping which advertises a milliner’s shop where the perpetrator of an unholy cult holds ceremonies on specific nights. Such clues might require significant work before the Player Characters understand their true significance – cruel Game Moderators might even drop some of these as “red herrings” which ultimately prove entirely unrelated to the matter at hand. Local News Articles: Is that person mentioned in the article someone important to the plot? Did the reported events occur at some local place of significance? Is there something important in eye-witness accounts that constitutes a clue? Long-Distance News Articles: Is that strange person mentioned in the article originally from the Arkham region? Or has relatives locally? Is some unique artefact described in the clipping coming to Arkham for some reason? Does that strange organization also operate locally, with similar practices? Might someone in the Arkham region see this article and be inspired to take some action? Editor’s Mailbag / “Agony Aunt”: Does the opinionated polemic written by the editor describe local people or common local practices that relate to the plot at hand? Did the perpetrator of some heinous crime first write a semi-delusional letter to the newspaper foreshadowing their crimes? The Want Ads: Classified advertisements can hide a wealth of obvious or cryptic detail. What is really behind that strange Lost & Found listing? Why does that advertisement promise a mortgage deal that seems far too good to be true? Why is someone looking to purchase something strangely obscure and specific, and promising extravagant compensation? Display Advertisements: Is there some peculiar minor detail about the products shown in that store’s lavish advertisement? Does that new documentary film screening at a local picture house somehow describe people or places important to the investigation? Is it possible the local business mentioned in the advertisement might have some specialist information or equipment that is relevant to the current story? Memorials / Funeral Notices: Is one of the persons recently deceased somehow tied in with the current plot? Or someone with the same family name? Does the memorial notice mention the deceased was a long-time member of some organization or association pertinent to the story? Society / Magazine-Type Columns: Why does that society figure photographed at a charity gala have the same surname as the low-life criminal currently under investigation? Is there something more to the upcoming celebration being planned by that oddly-named society? Is there something odd about that old abandoned house that is the subject of the Historical Society’s repeated efforts to save despite local objections? Puzzles: Is there something sinister encoded into the cross-word clues? Or is there some significance to the strange glyphs that someone has written in place of letters in that copy of the cross-word found at the murder scene? 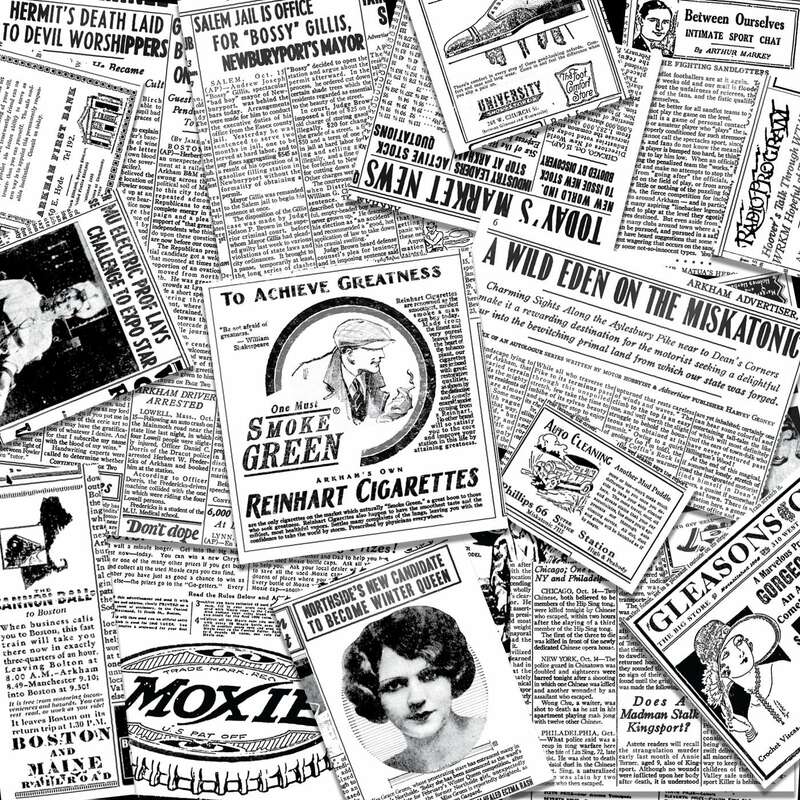 You don’t need to limit your use of newspaper article clues to merely the kick-off of a scenario or tale – with a bit of imagination you can use news clippings as a great source of much-needed information during the middle stages of an investigation. Investigative scenarios have a habit of leading Player Characters into dusty library stacks or museums in search of vital pieces of information – newspaper clippings can serve as one evocative means of delivering those key clues. Investigating characters might have a particular reason for hitting the newspaper morgue, or perhaps they are just in the market for some details about the past actions of some person or organization and willing to scour every possible historical document. Either way, the clues they seek could be trapped in the pages of a musty old newspaper. 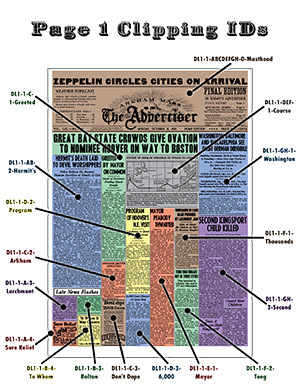 Conceivably, a Game Moderator might even use historical newspapers to provide clues relevant to a scenario set long after the 1920s – perhaps even in the modern day. In that case, the ink-stained fingers and dusty stacks of newsprint might make way to digital databases and careful online searches. In the midst of an investigation the Player Characters may be on the trail of a suspicious individual, tailing them from place to place but never quite catching up with them. That’s not to say that they can’t pick up clues from places their suspect has recently visited – and the quintessential newspaper clipping frantically marked with hand annotations can be a great method for drawing some attention to key information. Of course, it could equally well be a deliberate ruse perpetrated in an effort to mislead the Player Characters – but until they’ve investigated, who knows? As investigative scenarios proceed, the Player Characters slowly build up more and more detail about what is really going on. At key points, their understanding of the true nature of a person, place, or organization might suddenly make some stray piece of (previously innocent-seeming) detail suddenly take on a whole new meaning. One way of building such a “lightbulb” moment into a scenario is having a key clue built into an innocuous newspaper clipping which the Player Characters read that morning over grapefruits and boiled eggs, then promptly forgot about … Sometime later, their fevered brain recalls that stray piece of information when it seems – impossibly – to tie in with a hidden conspiracy whose concealment they are just starting to peel back. Time to race home and hope that newspaper hasn’t been put out with the trash! 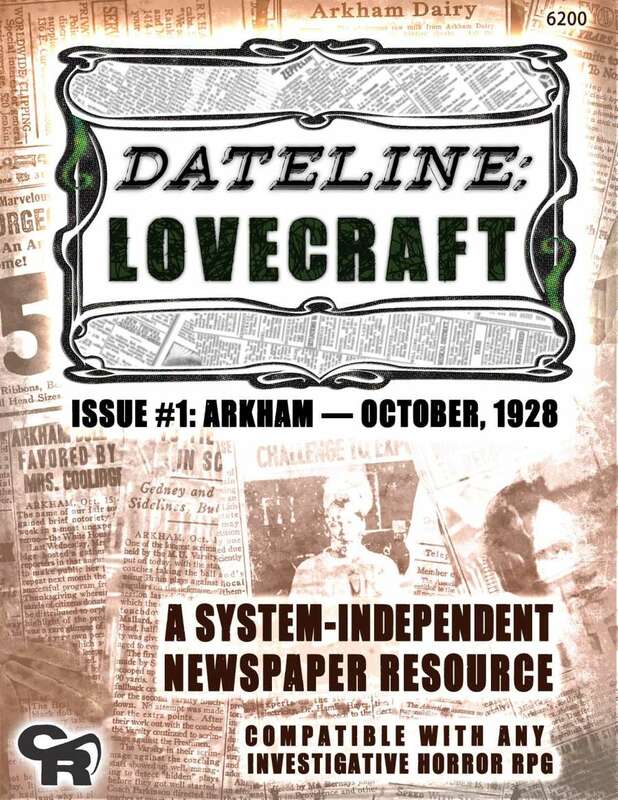 Keep an eye out for the release of Dateline: Lovecraft (hopefully sometime in the next couple of weeks).